Adding concrete pavers, cement pavers, brick pavers, or other hardscape materials to your garden is a great choice. However, you may be overwhelmed with all the options and design possibilities. Here are some things to consider when planning your next garden paving project. Now, on to the ten ideas! 1) The type of material you choose is very important. Price, quality, and durability will vary depending on the material, brand, and manufacturer. We here at Concrete Pavers Guide recommend garden paving stones for your next project for many reasons that can be found all throughout this site. Just to mention one, concrete paver installations stand up well to the use and abuse that they can be subjected with. The garden paving stone is a very durable critter. Freezing and thawing cycles, for instance, can cause havoc with normal garden paving slabs made out of concrete or some other solid material, as they provide no protection against cracks or fissures. Pavers, on the other hand, will rise and fall with the freezing and thawing with no cracking or structural damage to the installation. More information on this article can be found all throughout this site – it is called the Concrete Pavers Guide after all! 2) One of the best garden paving ideas is installing a walkway through your garden or landscape. You can tailor this walkway to fit the dimensions of your garden, and you can use it to provide a walking path for your visitors through your front or backyard creation. They thus serve a dual use, which all great home improvement project should – aesthetics and function (looks and use). 3) Be aware of all the color options available for your pavers, as you will surely be able to find a combination that complements your landscape features nicely. It would be quite beautiful, for example, to have flowers with a color that matches that of your paving stone project. You can choose from single colors or double and triple color blends. 4) Create a backyard patio that centers within your landscape. Your scene will thus frame your beautiful patio, and the two will nicely complement each other. Imagine entertaining friends and family in your own backyard paradise! A paver patio is one of my favorite projects, as it adds so much to a yard. 5) Garden paving is often a good DIY project for those with little experience, as many of these installations need to be purely functional. You can then practice installing pavers or other materials without fear of marring your front walkway, driveway, or back patio. After you’ve gained facility in installing pavers, you can then move on to tackling projects with more aesthetic restrictions and needed skills. 6) If you are on a budget, you may want to consider other options for materials for concrete pavers. They are expensive, and so is the labor and time required to install them properly. You may choose to obtain garden paving slabs, despite the problems listed above. If the slab is small, you may see less cracking over time. However, your design options will be limited, especially if you create a walkway or patio out of these small slabs. 7) Don’t forget the idea of enclosing your patio and/or your garden. An enclosed patio is a great way to increase the ways and time you can use your patio and enjoy your backyard landscape and garden. 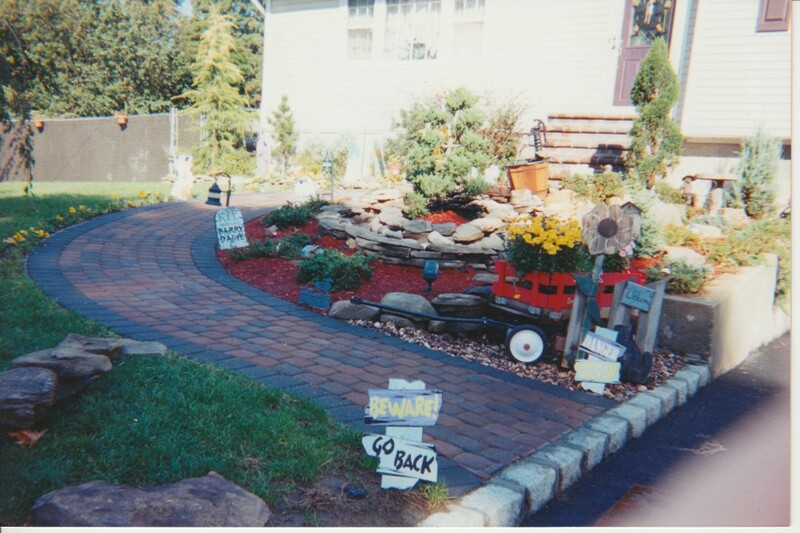 8) Landscape pavers can be used in many ways, ways that are only limited by your creativity. For instance, you can use them to edge different areas of your garden or landscape. You can also use them to build retaining walls; retaining wall pavers can be in the same color and style as the pavers you use for other projects around your yard. You can use other materials, such as landscape timbers, for your wall, or you can just use the plain poured concrete wall as well. 9) Adding structures to your backyard – such as statues or fountains – is a great way to increase the class and elegance of your home and garden. You can buy them preformed, of course, or you can find concrete molds for sale and make them yourself – as long as you feel proficient with pouring concrete! 10) Finally, consider using pavers to raise a particular area out of the ground. This can be done to create a raised paver patio, for instance. Building a paver patio doesn’t have to be hard, either, even if you are raising it, though most people will want to hire a contractor for the work. If you have any other garden paving ideas, or other questions or comments, leave them below! This entry was posted in Design Ideas and tagged garden paving, garden paving ideas, garden paving slabs, garden paving stone, garden paving stones by Will Grander. Bookmark the permalink.